GO! 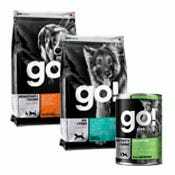 Solutions pet foods are produced by Petcurean - an independently-owned Canadian pet food manufacturer that was founded in 1999. Each recipe provides dogs and cats with a high-quality diet that supplies essential nutrients and energy. Go! 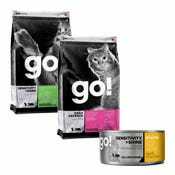 Solutions dry and wet formulas contain named meat meals (high-quality, concentrated protein sources) to help your cat or dog absorb more essential nutrients from a smaller amount of food. They offer a variety of limited ingredient formulas with the intent of finding a food that suits even the pickiest of eaters. GO! Solutions dry dog and cat food is made in Canada. Petcurean's senior nutritionist, Dr. Jennifer Adolphe has a Ph.D. in pet nutrition. She scrutinizes each decision and ingredient to ensure that they offer the right nutrition to nourish every pet. GO! Solutions are specially formulated to meet unique dietary needs. From life stages to sensitivities to picky eaters, GO! Solutions has a food that can help. Canadian Pride GO! Solutions is made by Petcurean, a family-owned and operated pet food manufacturer in the Fraser Valley of British Columbia, Canada. Absolutely No beef, corn, soy and by-products are used in GO! foods. All Natural No added growth hormones. Trusted Sourcing All GO! ingredients are sourced from trusted suppliers throughout North America, Australia, and New Zealand. Not sure which GO! Solutions formula is right for your dog? Try out the GO! Food Selector to get a recommendation based on your pet's needs.